Top stories from leading women's magazines: romantic, funny, peculiar and sometimes bizarre! 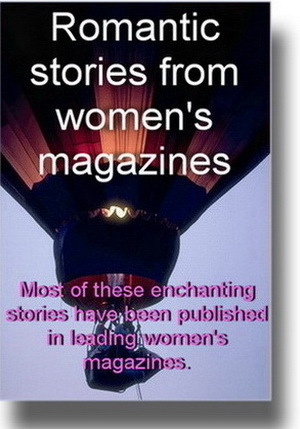 Romantic Stories includes top short fiction from periodicals such as WOMEN'S WEEKLY, CLEO, WOMAN'S DAY, ARGOSY UK and ABC Books. Read Brass Teeth here, runner up in the ABC's Lennie Lower Award. A droll story where the romance is exclusively between a politician and his self-image! This time, Canberra had been firebombed. It was definitely civil war. The few Army tanks had been sabotaged first. The intense heat made them ovens. The crews cooked in their jackets. Something had to be done. Bisk paused again before his mirror, enchanted by his eyebrows. Age had lent them character. They'd lengthened, acquired a twist. He encouraged it with his fingers then peered closer at his tie, the photographic tie. Gunfire rattled the windows. 'Hearne.' He struggled with the tie. There was a spot. Quite definite. The obdurate knot resisted, shielded by his second chin. The scourge of the Gordian Windsor. 'Hearne!' Where was the man? Blast the fool with his military mentality. What detained him? Insolence? Ataxia? A click-clack in the sacroiliac? For my next medical illusion I will thrust a ten-inch biopsy needle through this dormant colonel's spleen. Bisk did not turn. Best to address the beggar in profile. He continued surveying his image. Fondly. Face side-tilted. A violinist, no less. Vice-like chin in velvet jowl. The expression was the thing that made a maestro more than second-string. One had to look constipated. Spastic in the jolly colon. After all, true art was a process of elimination. Washington on the line? Well, it was a good drying day. Once more he was enthralled by the myriad synapses of his mind. The fellow was quite flustered rendered insensate by a squawk of history. Agog at Magog. Rather good, that. Wrested from his robot calm. Hearne thought, God! We're going to be massacred, and they expect this twit to save the country? 'Celebrity shock. It will pass. You give too much importance to titles and events. It's the curse of the meat pie mind, the metronome intelligence. Right. Left. Black. White. Them. Us. Read Meister Eckhart's On Dispassion. It's in the library under "Sense". More explosions shook the building. Bisk opened the window and leaned out. It struck him as appropriate. A gesture of constructive fatalism. Style the last refuge of the cynic. Much of the city seemed alight. They were pumping water from the lake. A bullet shattered the ceiling above him. The fellow needed his sights adjusted. He hoped his personal bullet would be in the head and of reasonable calibre. The bedroom extension clicked and rang. Bisk checked his appearance again. The Great Man who would save the Lucky Country by a diabolically brilliant, last-minute concession while the world watched in awe. Further confirmation that history was a record of crime. Sentries unlocked the courtyard gate. The blast from the helicopter blew it open. Bisk leaned against the airstream and followed the colonel toward the plane. Two heads on a pike and a pleasant panorama. Remarkable. The machine took off immediately, slapping the air and shuddering in the graceless, nose-down posture that, to Bisk, distinguished helicopters from aircraft. The vibration massaged his flesh as he withdrew his pocket mirror. There it was again, the handsome, still youthful face familiar to millions but never more sincerely loved than here by its audience of one. He adjusted the hair but the tie still had a spot. He dribbled on his finger and rubbed saliva on the stain. Nature's own enzyme. How simple life could be. Hearne watched him with distaste. Only one man could stop the carnage. Bisk. This madman slagging on his tie. The chopper banked, losing altitude. The TV station was now below them with its square landing pad and crimson windsock. Good luck, he thought. The lure of the lottery. Hope against all odds. At least there was no fate worse than life. They landed and Hearne slid the door back, climbed out to help Bisk down, then saluted. Bisk shook his hand with warmth. God bless the Army trained to be pure in heart, to obey whichever crook prevailed. Officials trotted toward them. His press secretary, Johnston, took charge. Along the bare studio corridor. Left into make-up. Lights. Mirrors. Fuss. His performance today would be live. The flat light of video would show each flaw and hesitation. The enemy would be there in the room, an arm's-length from him. The world would judge every word, every look, every blink. While his aides tried to brief him, Bisk retreated to mental trivia. In Lettow had he reysed and in Ruce. Three census and six demptis. Sinister dexter baker's man. Si'l vous plait coupe Chevrolet? He approved his make-up and rose the actor in the wings. The group parted and he headed for the toilet. The security men waited outside. In the washroom, he re-combed his hair. Peace again. He began to hum, savouring the echo, the finale of The Yeomen. Why didn't Sullivan round it off? Instead, he cut it short as if late for the casino. Self-indulgent little invalid. He turned his attention to the urinal. He knew a great deal about plumbing. The cistern was a Doulton with silencer and plastic fittings. George Bisk, he thought Renaissance man. Bisk sipped his fly, walked to the door. The zip moved an inch, then jammed. He muttered and tried more force. Finally, he looked down. Two teeth had been ripped from the material and his fly, beneath his portly belly, gaped each time he moved. He forgot about the concessions. He forgot about the nation. All he knew was that historic appearances demanded consummate style. In fifty years, they wouldn't care who won the civil war. But they'd remember his open fly. It was too much. Too much. Burning his library, the pigs! When Johnstone burst in, the Prime Minister was locked in the toilet. In the sound-proof studio a murmur began, then the chanting. Then the roar. Bisk, perched on the toilet, nurtured the thought that history had become, for once, a record of mechanical failure. The notion quite appealed to him. While his aides frantically battered on the door, he smiled. Romantic Stories has a companion volume - Vicious Tales from Men's Magazines. Hard-boiled fiction for men. Click the cover to check it out. And if brilliant short fiction interests you, click on Songs of a Second World. The tales in this collection have won ten literary awards.